on behalf of the GARFIELD-VTE investigators› Author Affiliations Funding The GARFIELD-VTE registry is an independent academic research initiative sponsored by the Thrombosis Research Institute (London, United Kingdom) and supported by an unrestricted research grant from Bayer Pharma AG (Berlin, Germany). 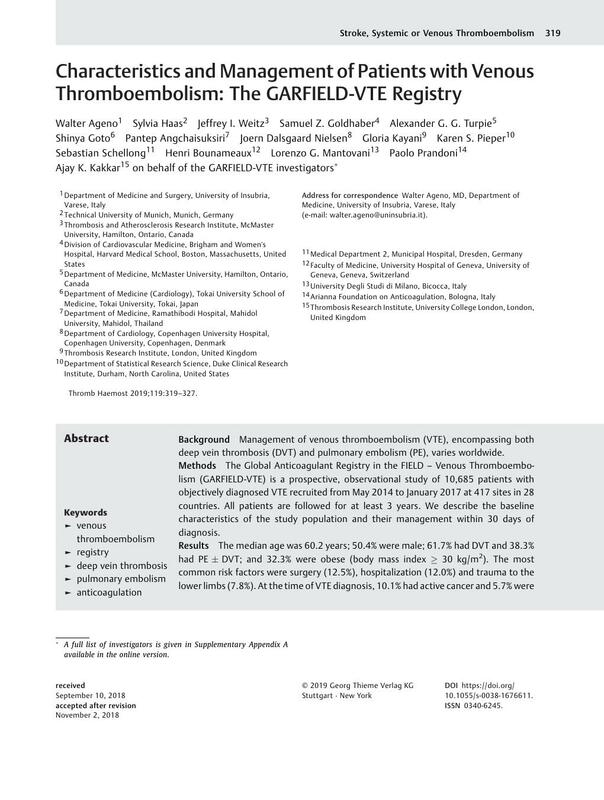 Background Management of venous thromboembolism (VTE), encompassing both deep vein thrombosis (DVT) and pulmonary embolism (PE), varies worldwide. Methods The Global Anticoagulant Registry in the FIELD – Venous Thromboembolism (GARFIELD-VTE) is a prospective, observational study of 10,685 patients with objectively diagnosed VTE recruited from May 2014 to January 2017 at 417 sites in 28 countries. All patients are followed for at least 3 years. We describe the baseline characteristics of the study population and their management within 30 days of diagnosis. Results The median age was 60.2 years; 50.4% were male; 61.7% had DVT and 38.3% had PE ± DVT; and 32.3% were obese (body mass index ≥ 30 kg/m2). The most common risk factors were surgery (12.5%), hospitalization (12.0%) and trauma to the lower limbs (7.8%). At the time of VTE diagnosis, 10.1% had active cancer and 5.7% were chronically immobilized. Treatment for VTE was anticoagulant (AC) therapy alone in 90.9% of patients; 5.1% received thrombolytic and/or surgical/mechanical therapy ± AC and 4.0% received no therapy. Pre-diagnosis, 12.8% received AC therapy alone and 0.2% received thrombolytic and/or surgical/mechanical therapy ± AC. After diagnosis, parenteral AC therapy alone was administered in 17.6% of patients, and it was followed by a direct oral AC (DOAC) in 16.4% or a vitamin K antagonist (VKA) in 26.8%. DOACs alone were prescribed to 32.3% of patients, while 5.9% received VKA alone. Conclusion The initial findings from this global registry highlight the heterogeneity in characteristics and management of VTE patients. Prospective follow-up will reveal the impact of this heterogeneity on outcomes. The lead authors affirm that the manuscript is an honest, accurate and transparent account of the study being reported; that no important aspects of the study have been omitted. Independent ethics committee and hospital-based institutional review board approvals were obtained, as necessary, for the registry protocol. * A full list of investigators is given in Supplementary Appendix A available in the online version.